What is live chat software and why do I need it? In a digital world, speed is king. From overnight shipping to instant access to your product or service, your customers want things now – and they usually get it. However, this is not the case when it comes to customer service. Research shows that the average respond time for customer service requests on social media is 10 hours. Worse still, email response times take longer than 12 hours! This is not acceptable. And delays like this will lose you customers. But, how can you respond quickly to your customers? It’s simple – use live chat. Live chat software enables you to have real-time conversations with your customers while they’re on your website. It’s quick, convenient and customers love it because it’s 100x faster than any other digital service channel. Companies from major banks to small e-commerce stores now use live chat software to better service their customers and improve response times. So, it’s no surprise that 33% of consumers now expect to see live chat offered on every website. But, there’s a lot more to live chat software than providing quick customer support. That’s why we’ve rounded up 9 live chat software benefits to show you how chat can positively impact your business. The first major benefit of using live chat on your website is the potential to increase sales. The American Marketing Association found that B2B companies who used live chat see, on average, a 20% increase in conversions! While browsing your website, prospects and customers will have questions about your product or service. With live chat, you can answer them immediately – and while the buyer is still on your website. This is what makes live chat so powerful. Live chat gives you the chance to hold your buyers’ by the hand, help them overcome objections and reach a buying decision. It’s like having a sales assistant on standby, live on your website. Furthermore, a report by eMarketer looked into the impact live chat has on consumers. The report found that 35% more people made a purchase online after using live chat. It’s no secret that customer support can be expensive. In traditional call centers, a customer service agent will handle both phone and email requests. But, only one at a time (can you imagine trying to answer two calls at once?). The benefit of live chat software is that it changes all of that. Being able to handle several customer chats at once means you’ll need a substantially smaller team to handle customer service requests – cutting your support costs as a result. If that’s not enough to persuade you, live chat is more than 50% cheaper than handling phone calls. Within months of launching live chat on their website, WP Engine were able to solve more than 90% of all questions and issues immediately – reducing their customer support costs almost overnight. When you walk into a physical store, the retailer gets the chance to build a rapport with you during the sales process. This helps them establish trust and make the sale. But online, you can’t do that. Consumers’ are naturally skeptical of buying things from people they don’t know. It’s human nature. But, with live chat, you can have a direct conversation with your buyer that allows you to build trust and close the gap between online and offline purchases. Trust is extremely important in the business world. If a buyer doesn’t trust you, they won’t provide their contact information or share their personal details. A study from ATG (now acquired by Oracle) into Global Consumer Trends found that 90% of customers said the “Live Chat” button gives them confidence that they can get help if they need it. Without live chat, you’re going to have to work a lot harder to build trust with your website visitors. A study into live chat by Telus International found that many businesses are still not benefiting from the power of using live chat on their websites. In fact, our own live chat study of 1,000 websites found that only 9% of websites use live chat to provide real time support to their customers. Josh Ledgard, founder of Kick Off Labs, is a firm believer in using live chat support as a way to differentiate yourself from the competition. In one example, Josh shared a story how he used the live chat software itself as a way to earn a new customer. So, the next time a buyer asks you how you are different to your competitors, you can respond by using live chat. Live chat doesn’t just help you increase sales – it also helps you increase the value of a sale too! By using live chat to talk with the buyer and understand their needs, you can recommend similar products and services by up-selling and cross-selling to increase the average order value. For example, if a buyer is looking to purchase a new laptop, a chat agent can respond by recommending a laptop that meets their needs. But, an agent can also increase the average order value by recommending a laptop case, a bag and any laptop related accessories. Internet Retailer found that Virgin Airlines used live chat to transform their business. Using live chat software, they up-sold customers with additional products and converted them 3.5x more often and saw a 15% overall increase in average order value as a result. Live chat is a great opportunity to improve customer support and provide a memorable customer experience on your website. That’s why customers prefer using live chat. The reason for live chat’s high satisfaction levels are due to “the efficiency and immediacy of the experience”, says Kirk Parsons, a Senior Director at Market Research company, J.D. Power. Sure, you can offer traditional ways for people to contact you, but why not communicate with your customers in a channel that they prefer? By doing so, you will retain more customers. Unfortunately, not everyone who visits your website will buy from you straight away. So, what happens when a visitor leaves the site? Do you sit back and hope that they come back at some point in the future, or do you do something about it? For people that use live chat, you can collect information about them – and turn them into leads. Before a live chat session begins, ask the user for their contact information. Not only does this help in identifying an existing customer, but by asking for their name you can provide a more personalized customer experience. If the chat user isn’t a customer, you now know who they are. Use this to your advantage and ask them if they would like to receive news and promotional material as part of your email marketing strategy. They may not buy from you today, but by having their contact information you can convince over time that your product is the right fit for them. Another benefit of using chat is that even if you’re unable to collect contact information the first time around, 63% of consumers are more likely to return to a website that offers live chat. So, rather than communicating with anonymous visitors, you will be speaking with engaged prospects instead. With live chat, your customers no longer have to stop what they’re doing and pick up the phone or send an email when they have a question. Instead, they can have their questions answered immediately by a live person. This is important – especially when it comes to purchasing or subscribing to products online. Forrester Research found that 57% of customers abandon their purchase if they can’t get their question answered quickly. In addition, the same study found that 44% of online consumers rate having their questions answered by a live person while in the middle of a purchase as one of the most important features a website can offer. While improving the website experience helps customers, the business benefit here is that customers that use live chat on a website are 3 times more likely to make a purchase – making a positive impact on your bottom line. Live chat is typically found on the home page and product pages, but another way to use live chat to improve the website experience is by placing chat in unusual places, such as 404 pages or pages that have been deleted. 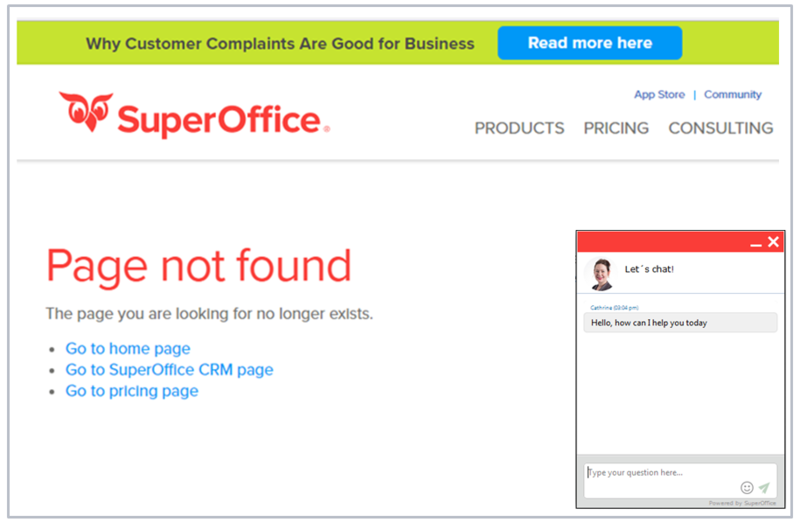 When your customers’ arrive on a 404 page, they usually leave. Now, a live chat agent can help them navigate and find what they are looking for. A key part of any marketing campaign or sales process is to understand your buyers’ needs and then provide the right solution to them. Not only does live chat software give you the opportunity to close a sale right there and then, but it also gives you access to their mindset by gathering what is known as “Voice of Customer Data”. Voice of Customer (VOC) data is a market research tool that can help you see your business from a customer’s perspective. By collecting VOC data you can understand their thoughts, opinions and behavior, which can then be used to shape product development, marketing and the way you grow your business. One way to collect VOC data through live chat is to review chat transcripts. You and your team can review valuable information such as words, phrases and questions that buyer’s use, which you can then use to optimize your marketing copy to eliminate fears and doubts. According to Aberdeen Research, companies that collect VOC data enjoy a 10-times-greater year-over-year increase in annual company revenue compared to all others. If you want to succeed in business today, you can no longer ignore live chat software. Your customers want access to fast and immediate support that helps them along in their purchase process. The good news for you is that very few companies use live chat, making it far easier to stand out from the competition. Using live chat, you can communicate with your customers in a channel they prefer and use that to provide an unforgettable experience. If that’s not enough to convince you of the benefits of live chat, you will also decrease support costs and increase average order value and overall sales. There’s no denying that the live chat software benefits for your business are huge. It’s not a question of if you will use live chat for your business, but rather a question of when. So, how long will it be before you start using live chat software? 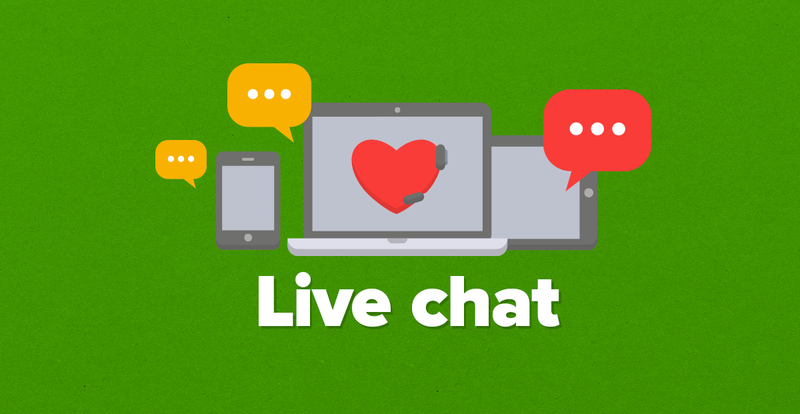 What other live chat software benefits would you like to add? P.S. If you enjoyed reading the benefits of live chat software, please share it here! Great list of live chat benefits! I've never considered live chat software before, but we certainly need this. It provides an easy way to engage with customers. Hi Steven, Excellent list. This is so far the most comprehensive list of live chat benefits I have come across. For a business, live chat offers innumerable benefits. And in this tech-driven world of today, it is important for businesses to leverage this tool not just to meet their customer needs but also to improve their offerings. As a small business owner when I decided to empower my team with live chat, I wanted to ensure that it helped improve productivity and measure performance. This is when I came to know about live chat software. An online chat tool allows me to track the performance of my agents and offer personalized support. I am a big fan of live chat software ratings and canned response features. The best thing is that I don’t have to undergo any technical training to use live chat. The point I am trying to put forth is that organizations should not shy away from using live chat because consumers prefer businesses that allow them to connect instantly. Nice list of benefits. I already use live chat on my e-commerce website. My sale conversions have gone up by 70% and I can provide quick customer service through live chat - making my customers very happy - which results in customers buying more of the products. I recommend all kind of businesses to use live chat software on their website. Great list of live chat benefits. It's very important to have live chat support for your business. I think CRM is also quite important in business nowadays. Great article! Live chat is a great tool for businesses to have. It provides some quick results and reduces frustration through an automated system. Now a days, consumers are always looking for something quick and easy and live chat is exactly that! Thanks for sharing this blog post on live chat benefits. Very insightful article on Live chat software and its benefits. One more thing I will add to this is contextual messaging. Context helps in giving the right message to the right user whenever he (or she) is on the website. Great list of benefits! I would definitely recommend live chat on any website. My personal experience with live chat is that it helps me to communicate better with website visitors and increase business leads. Great point, Joann. Thank you! Hey there Steven! Love the article. I have been using live chat software for a while now and the results have been exceptional. My customers are happier and I'm learning new things about what they need every day! To increase business sales - use live chat!